The Craft & Carry Tote is a multipurpose tote you will use for years to come. 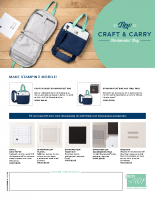 The Craft & Carry Tote features a canvas bag with two carrying straps that make it easy to pack supplies to your events. The tote includes interior repositionable inserts so you can rearrange carrying space to accommodate all your favorite products. The tote also features the Stampin’ Up! logo. When you use your tote, you’re advertising your business! The Craft & Carry Tote #149696, $50. Not a demo yet? You can get this now in a Demo Kit thru January 2 while supplies last (it will also be offered during Sale-a-bration’s Demo kit). Click here for details. How does your crafty bags cost?